Vienna - Sanctions imposed on Iran over its nuclear program have been lifted following the International Atomic Energy Agency’s confirmation of Tehran’s commitment to​ the Joint Comprehensive Plan of Action (JCPOA). European Union foreign policy chief Federica Mogherini and Iranian Foreign Minister Mohammad Javad Zarif made the announcement during a joint press conference in Vienna on Saturday. The chairman of Expediency Council on Saturday congratulated Supreme Leader Ayatollah Ali Khamenei, the government and especially the brave and faithful Iranian nation on termination of sanctions. Ayatollah Akbar Hashemi-Rafsanjani in his address at the Saturday session of the Expediency Council referred to the last stages of implementing the Joint Comprehensive Plan of Action (JCPOA) which will pave the way for the termination of anti-Iran sanctions, congratulating the occasion to the Supreme Leader of the Islamic Revolution Ayatollah Seyyed Ali Khamenei, President Hassan Rouhani and the Iranian nation. 'The process of negotiations and work which has led to this stage has been very intensive, tough and based on wisdom and prudence,' said Rafsanjani, appreciating the perseverance of the president, the government and especially the nuclear negotiating team, whom he said were all fully supported by the Supreme Leader of the Revolution. Stressing the need for the other side's commitment to its respective obligations throughout the implementation of the JCPOA, Hashemi-Rafsanjani said that in case the six world powers breach the terms and conditions of that agreement the Islamic Republic, too, will act accordingly. Meanwhile, Rafsanjani referred to the recent incident in the Persian Gulf engaging a number of US Navy marines just on the verge of implementing the JCPOA and the upcoming Iranian parliamentary and Leadership Experts Assembly election. 'The issue which could lead to a serious new controversial issue both inside Iran and in the world, especially on the verge of implementing the JCPOA and the February elections, was resolved rapidly and wisely through the government's prudence and IRGC's cooperation finely and we hope for other sensitive issues always this approach will be adopted,' he added. Executed cleric Nimr al-Nimr was the most vocal critic of Saudi Arabia's ruling Al Saud family in the kingdom's Shi'ite Muslim minority. Here are excerpts from video and audio recordings of his speeches and sermons published online. "(Bahrain's ruling family) Al Khalifa are oppressors, and the Sunnis are innocent of them. They're not Sunnis, they're tyrants. We do not defend oppressors and those oppressed shouldn't defend the oppressor." In one version of a sermon posted on July 9, 2012 he spoke about the death that year of Saudi Crown Prince Nayef, a former interior minister who was widely seen as the stern face of the kingdom's conservative establishment. Last year, Nayef's son Mohammed became Saudi Arabia's new crown prince and interior minister. 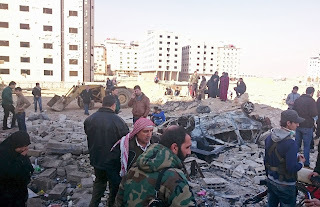 "Where are Nayef's soldiers now? Will they stop him from death? Where are his intelligence (agencies)? Where are his officers? Can they stop the Angel of Death from reaching him? Let the worms eat him and (let him suffer) the torments of hell in his grave." "Why doesn't he retire? Does the angel of Death have to take his soul? Nayef doesn't retire, the Angel of Death has to take his soul to rid us of him." "Why shouldn't we be happy? The one who killed our children, we shouldn't be happy in his death? The one who imprisoned our children, we shouldn't be happy in his death? The one who makes us live in terror and fear, we shouldn't be happy. "Thanks be to God and may he take their lives, one after the other." 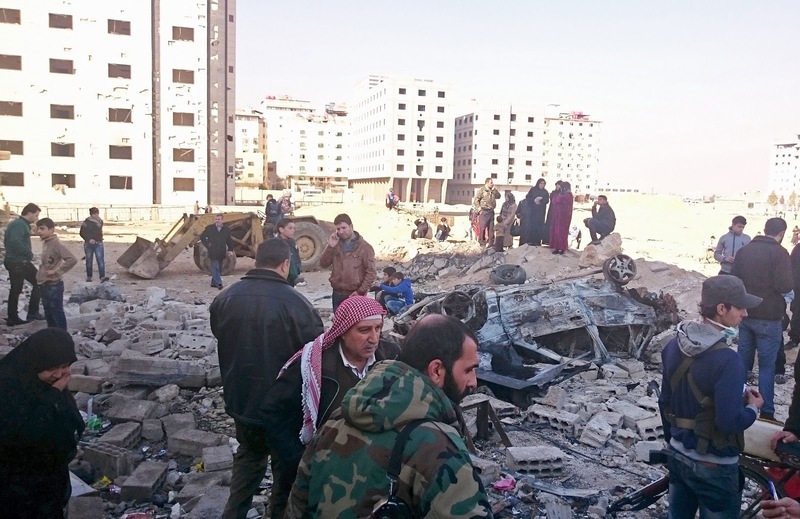 "The Al Saud who have killed our children ... (it) is a shame that cannot be purified." "Our strength is not with weapons, our strength is with the spirit of martyrdom." "From the day I was born and to this day, I've never felt safe or secure in this country.... We are not loyal to other countries or authorities, nor are we loyal to this country. What is this country? The regime that oppresses me? The regime that steals my money, sheds my blood, and violates my honour?" "A century of oppression ... enough, we will not be silent and we will not fear. We will call for separation even from this country and let be what will be. Our dignity is dearer than the unity of this land." "Our loyalty is for God only ... it's not to Al Saud... it's not to any other country." “We asked very clearly for the American president to intervene as a friend of Saudi Arabia — and the Americans did not intervene,” he said in a telephone interview from al-Awamiyah, a village situated in the Qatif region in Saudi Arabia’s Eastern Province. This statement came on 05 Jan. 2016 from Mohammed al-Nimr, brother of Sheikh Nimr Al-Nimr to an online news portal. Mohammed al-Nimr’s own son, Ali Mohammed Baqir al-Nimr, has also been sentenced to death over his alleged role in anti-regime protests in 2012, when he was 17 years old. Mohammed al-Nimr said that, in the aftermath of his brother’s execution, he is now increasingly concerned that his son will also be put to death. Saudi security forces have opened indiscriminate fire on vehicles and buildings in a Shia-populated town in the country's east, where a contingent of armored vehicles arrived on Tuesday to curb any unrest. The kingdom is on edge over fears of possible protests following its execution of prominent cleric Nimr al-Nimr. Early Tuesday, armored vehicles stormed al-Awamiyah in a show of force, the Shabab al-Ahrar activism group reported on its Facebook page. 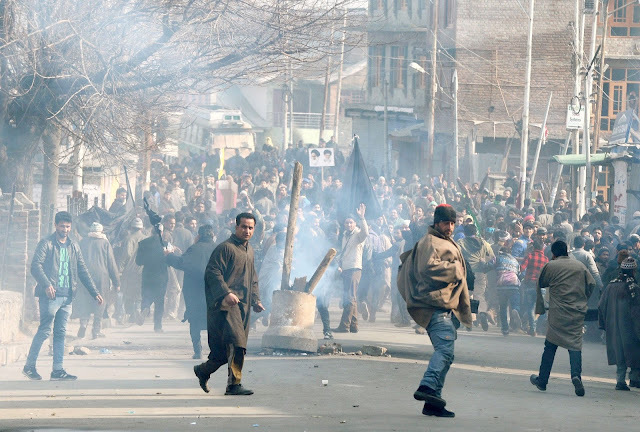 It said security forces then started to fire at about two dozen vehicles in the city, resulting in damage to some residential buildings and shops. The town as well as the Qatif district, both in the restive Shia-dominated Eastern Province, have been the site of peaceful demonstrations since February 2011. Demonstrators have been voicing protest at Riyadh’s suppressive policies against its Shia minority. Security forces have also been alerted across Saudi Arabia in the wake of the kingdom’s execution of Sheikh Nimr, who was an outspoken critic of Riyadh’s policies and its treatment of the Shias. Hundreds of armored vehicles headed to Qatif to quell any potential protests as the kingdom announced its executions on Saturday. Riyadh, Jan 4 - Gunmen killed a civilian and wounded a child when they opened fire on Saudi police in the home village of executed Shiite cleric Nimr al-Nimr, state media reported today. Police came under "heavy fire" during the attack last night in the eastern village of Awamiya, the birthplace of the cleric who was executed on Saturday, said the Saudi Press Agency. The shooting left a civilian dead and wounded an eight-year-old child, said SPA, without specifying if any police were among the casualties. Security forces were scouring the area for the assailants, the agency reported, citing a police spokesman in oil-rich Eastern Province. The execution of 56-year-old Nimr has fuelled tensions in the Middle East, with Shiite-majority countries expressing condemnation and the kingdom's diplomatic missions in Shiite-dominated Iran coming under attack. The assaults on the diplomatic missions spurred the Sunni-ruled kingdom to sever ties with Shiite-dominated Iran, its long-time regional rival. 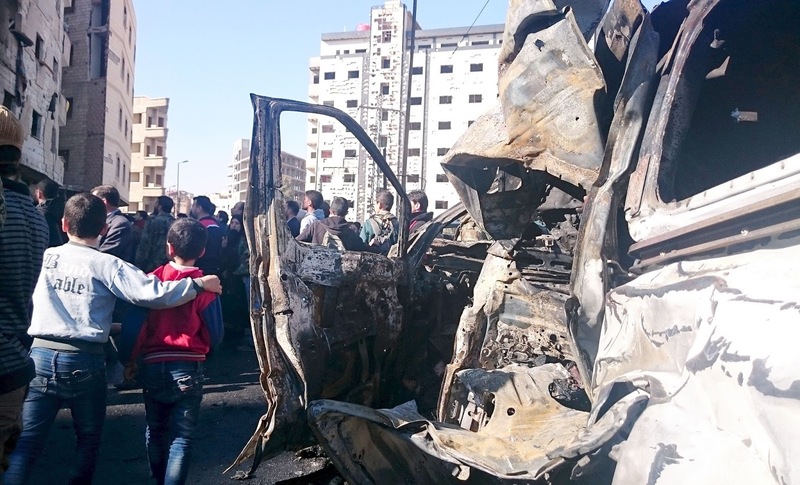 In recent years, the two countries have been divided over the war in Syria, where Iran is backing the regime, and the conflict in Yemen where a Saudi-led coalition is battling Shiite rebels. Tehran, Jan 4 - Demonstrators took to the streets of Tehran for a third consecutive day of protests today after Saudi Arabia executed a prominent Shiite cleric and broke off ties with Iran. 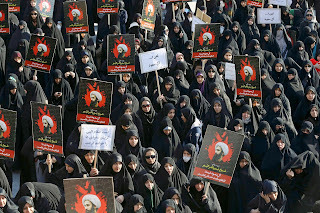 Some 3,000 demonstrators gathered in Imam Hossein Square in eastern Tehran, chanting slogans against Saudi Arabia's Al-Saud royal family following the kingdom's execution on Saturday of Sheikh Nimr al-Nimr. 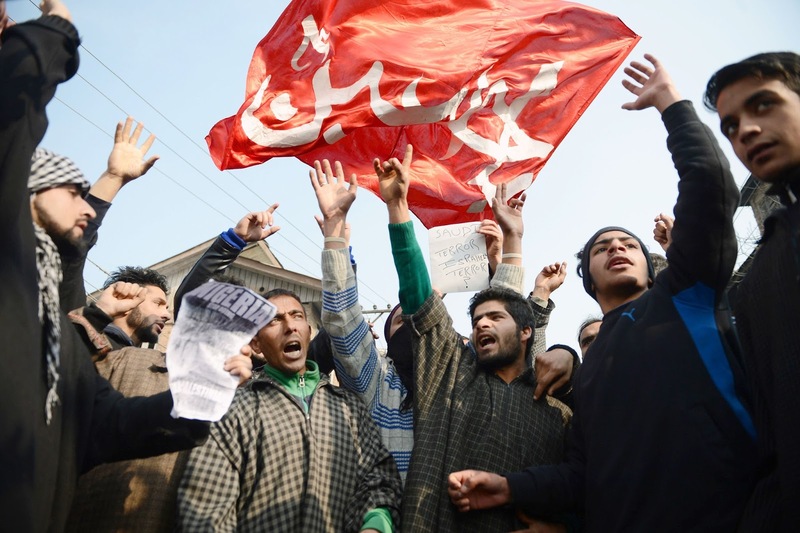 His death has sparked fury among Shiites across the Middle East with protests erupting in several countries. 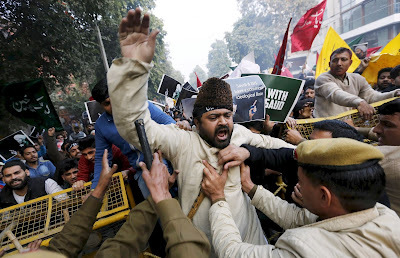 A mob on Saturday firebombed the Saudi embassy in the Iranian capital and a consulate in second city Meshhad, triggering regional and international condemnation. The assaults prompted Riyadh to break off diplomatic ties with Iran and order its diplomats to leave the kingdom. Saudi allies Bahrain and Sudan have followed suit and the United Arab Emirates downgraded its ties with Iran. Some protesters today criticised Iran's foreign ministry, saying it should have taken the initiative and broken ties first with Riyadh over the execution of Nimr, a force behind 2011 anti-government protests in Saudi Arabia. Others torched the flags of Israel, Iran's arch-foe, and of the United States which is one of Saudi Arabia's key Western allies. The Saudi flag which bears the Islamic statement of faith -- words that are holy to all Muslims -- was not set of fire. Hundreds of merchants from Tehran's Grand Bazaar also shuttered their shops and took part in the anti-Saudi protests. Baghdad, Jan 4 - Thousands of supporters of a prominent Iraqi Shiite cleric protested near the foreign ministry today to demand Baghdad sever ties with Saudi Arabia. 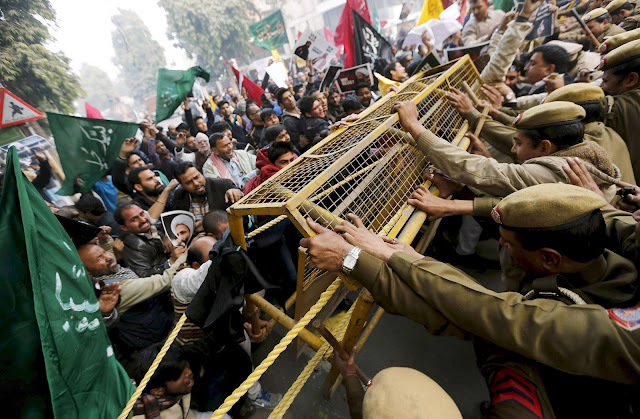 The crowd, which had gathered near one of the entrances to the fortified "Green Zone" where the Saudi embassy is located, threatened to force its way in but was held back by organisers and riot police. "We demand that the government close the Saudi embassy, kick out the ambassador and boycott all Saudi products and products from allied countries," said Hatem Oraid, a lawyer at today's demonstration. 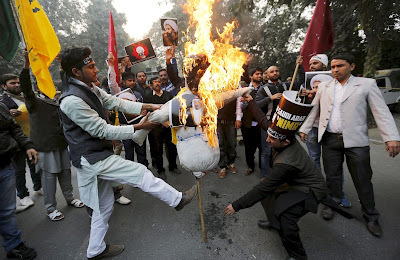 Riyadh, Jan 4 - Tensions between Iran and its Sunni Arab neighbours reached new heights today as Saudi Arabia and its allies cut or downgraded diplomatic ties with Tehran in a row over the execution of a Shiite cleric. 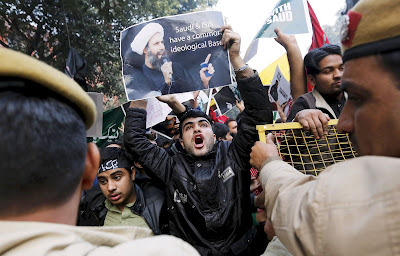 Angry exchanges following Saudi Arabia's execution Saturday of prominent Shiite cleric and activist Sheikh Nimr al-Nimr erupted into a full-blown diplomatic crisis as Riyadh and then Bahrain and Sudan severed their relations with Tehran, the main Shiite power. The United States and other Western nations urged calm, amid fears the dispute could derail efforts to resolve conflicts across the Middle East, from Syria to Yemen. It has also raised concerns of an increase in sectarian violence, including in Iraq where two Sunni mosques were blown up overnight. 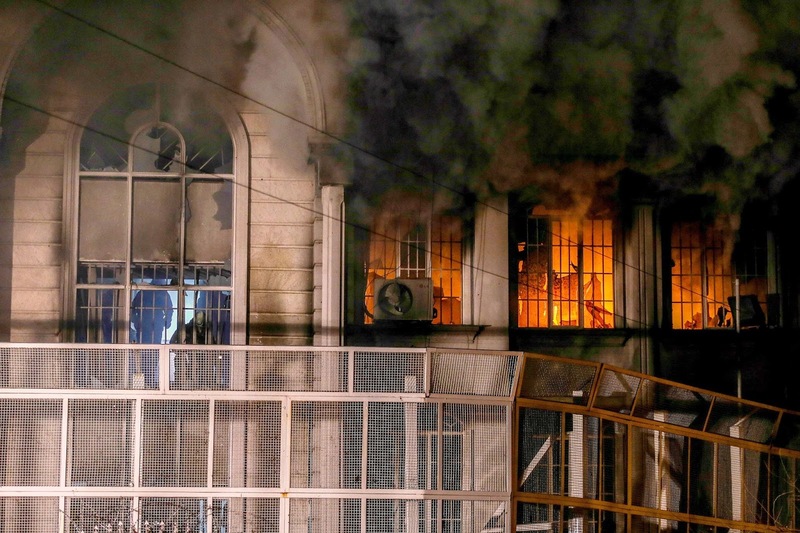 Saudi Arabia cut ties with Iran late yesterday, giving diplomats 48 hours to leave the country, after protesters set fire to its embassy in Tehran and a consulate in second city Mashhad. Bahrain and Sudan followed suit today, as Moscow offered to act as an intermediary between Riyadh and Tehran. The United Arab Emirates also downgraded its ties, recalling its envoy from Tehran and reducing the number of its diplomats in the country. 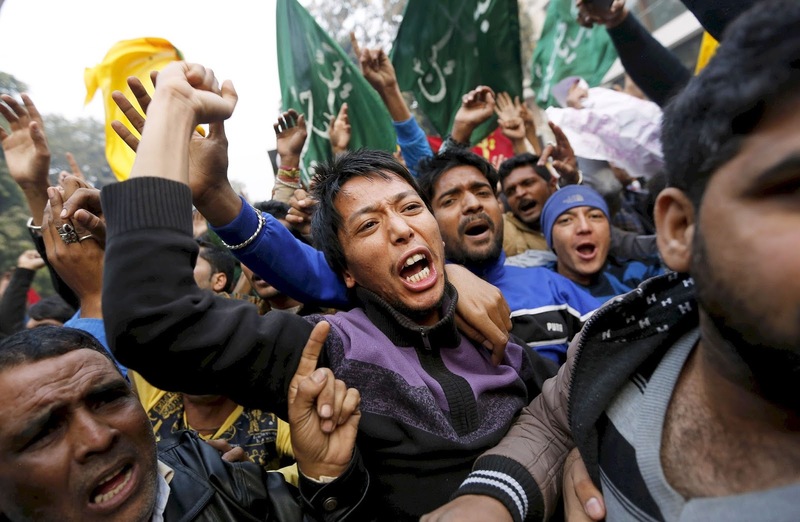 Iranian officials denounced the Saudi move as a tactic that would inflame regional tensions. Iran and Saudi Arabia are on opposing ends of a range of crucial issues in the Middle East, including the war in Syria -- where Tehran backs President Bashar al-Assad's regime and Riyadh supports rebel forces -- and Yemen where a Saudi-led coalition is battling Shiite insurgents. The spike in tensions comes after Iran last year secured a historic nuclear deal with world powers led by the US sparking major concern in Riyadh, a longtime US ally. 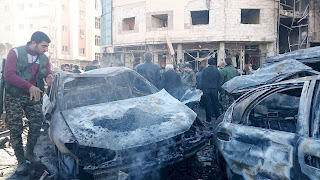 Hilla (Iraq) Jan 4 - Blasts rocked two Sunni mosques in central Iraq today, amid fears of renewed sectarian strife following Saudi Arabia's execution of a prominent Shiite cleric, police and medics said. Groups of men wearing military uniforms detonated explosives at two Sunni mosques overnight in the Hilla region, south of Baghdad, and a muezzin -- the person appointed to recite the Muslim call to prayer -- was shot dead near his home in Iskandariyah, the sources said. 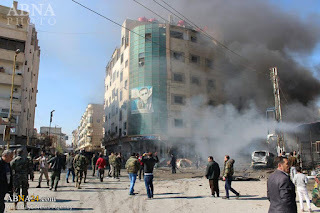 In Hilla, about 80 kilometres from the capital, a police officer said the Ammar bin Yasser mosque in Bakerli neighbourhood was bombed after midnight. 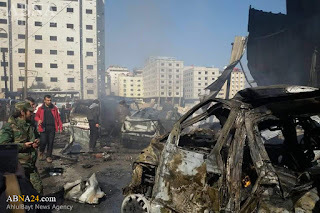 "After we heard the explosion, we went to its source and found that IEDs (improvised explosive devices) had been planted in the mosque," the captain said. "Residents said a group of people with military uniforms carried out this operation," he said, adding that 10 houses were also damaged. "They took advantage of the cold weather, there was nobody outside," he said. 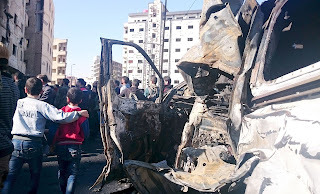 There was no immediate claim of responsibility for the blasts, nor for the killing near the town of Iskandariyah, about 40 kilometres south of Baghdad. A local councillor identified the slain muezzin of the Mohammed Abdallah Jabbouri mosque in Haswa as Taha al-Juburi. "He was ambushed by unknown gunmen near his house," a source in Iskandariyah police said. A doctor also confirmed his death. Iskandariyah is part of a mixed Sunni-Shiite area south of Baghdad which was once dubbed "the triangle of death" and was badly affected by sectarian violence last decade. Pushing back the Islamic State group in this region after the jihadists took over large parts of the country in 2014 was one of the priorities of the government and allied Shiite militias. That was achieved in a few months and IS has been largely eradicated from the area but violence -- not just of a sectarian nature but also crime-driven -- has remained frequent. Iraq's interior ministry condemned today's attacks, which it said were an attempt to incite civil strife but did not blame on any particular group. Najaf, Jan 3 - The execution of prominent Saudi Shiite cleric Nimr al-Nimr is an "aggression", Iraq's top Shiite authority Grand Ayatollah Ali al-Sistani said in a statement today. "We received with deep sadness and regret the news of the martyrdom of a group of our brothers in the region," he said. 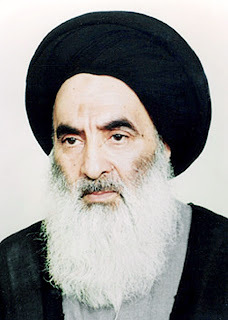 "The spilling of their pure blood -- including of the late cleric Sheikh Nimr al-Nimr, may his soul rest in peace -- is an injustice and an aggression," Sistani said. Other leading Shiite clerics in Iraq have reacted with outrage to the execution on Saturday by the Saudi authorities of Nimr and other Shiite activists. They were among a total of 47 people, most of them described by the interior ministry as involved in killings by Al-Qaeda. Moqtada al-Sadr, a well-known cleric who heads the Saraya al-Salam militia, said Nimr's execution was a "horrible attack" against Shiites and called for international condemnation. Mohammed Taqi al-Mudaresi, another cleric who is based in the holy Shiite city of Karbala, took a harder line. 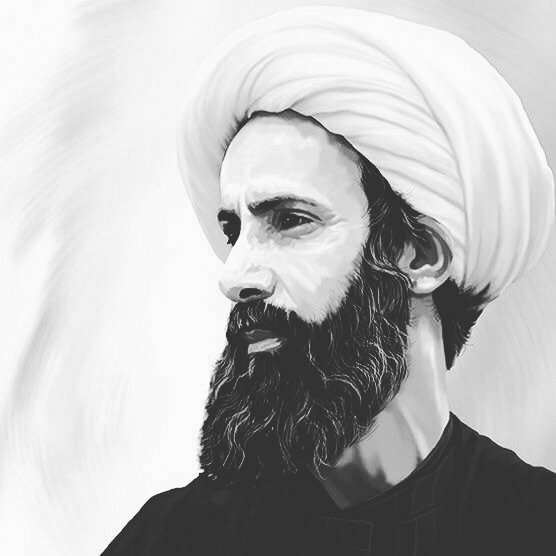 "The execution of the martyr (Nimr) isn't just a declaration of war against the People of the House (Shiites) but against all Muslims," he said in a statement. 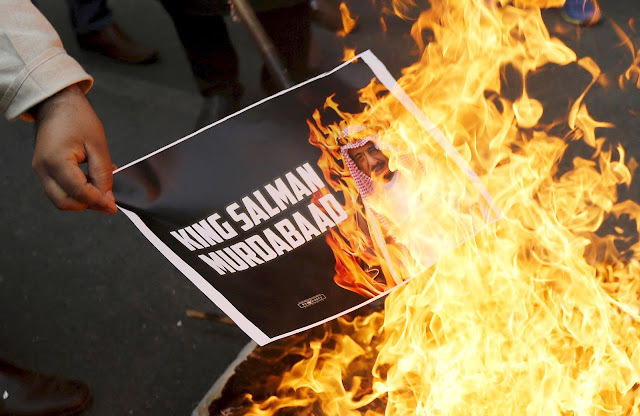 The executions also sparked a wave of anger in neighbouring Iran, where protesters firebombed the Saudi embassy in Tehran. The kingdom's mission in Iraq reopened on December 15, a quarter of a century after diplomatic ties were severed over the invasion of Kuwait. The embassy is located in the fortified part of central Baghdad known as the "Green Zone", which is home ot most ley institutions and embassies. Ambassador Thamer al-Sabhan, who arrived in the country four days ago, posted a message on social media in which he said they are being "looked after by the Iraqi government". Several clerics and protesters in Iraq have said that the embassy should be closed down and the envoy expelled over Nimr's execution. Iran's top leader today warned Saudi Arabia of "divine revenge" over the execution of an opposition Shiite cleric while Riyadh accused Tehran of supporting terrorism, escalating a war of words hours after protesters stormed the Saudi Embassy in Tehran. Saudi Arabia announced the execution of Sheikh Nimr al-Nimr yesterday along with 46 others, including three other Shiite dissidents and a number of al-Qaida militants. 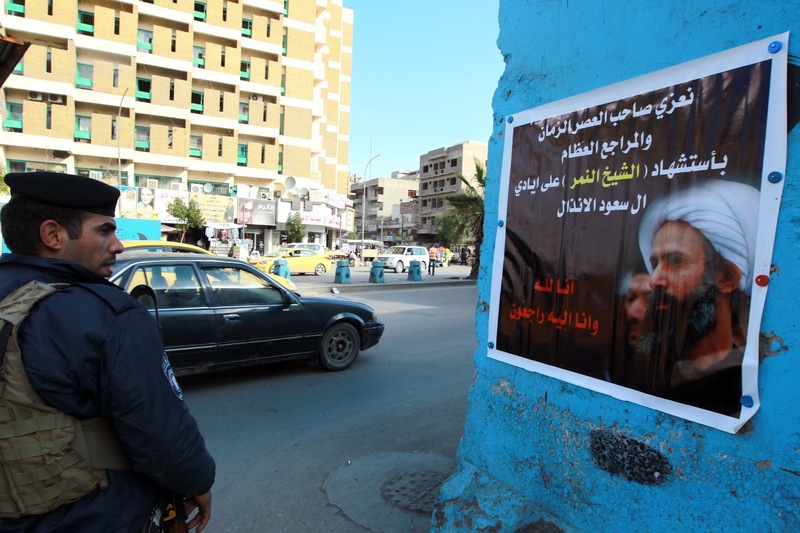 Al-Nimr was a central figure in protests by Saudi Arabia's Shiite minority until his arrest in 2012, and his execution drew condemnation from Shiites across the region. Iran's Supreme Leader Ayatollah Ali Khamenei condemned the execution today in a statement on his website, saying al-Nimr "neither invited people to take up arms nor hatched covert plots. The only thing he did was public criticism." The statement, carried by the official Saudi Press Agency, accused Tehran of "blind sectarianism" and said that "by its defence of terrorist acts" Iran is a "partner in their crimes in the entire region." Sunni Saudi Arabia and Shiite Iran are locked in a bitter rivalry, and support opposite sides in the wars in Syria and Yemen. 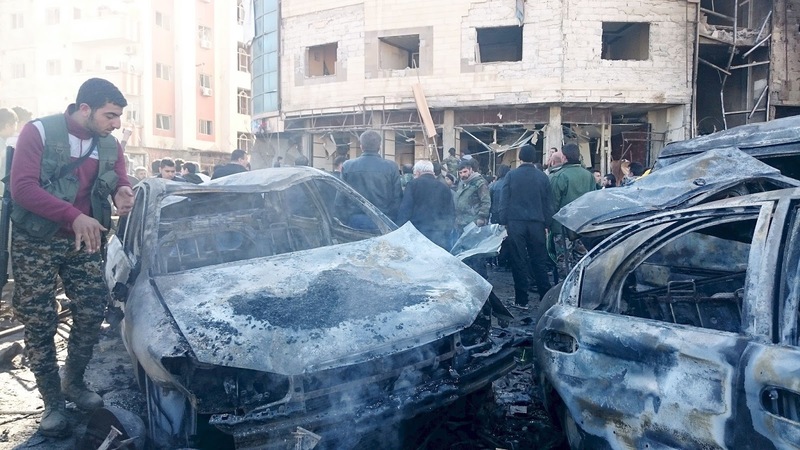 Iran accuses Saudi Arabia of supporting "terrorism" in part because it backs Syrian rebel groups, while Riyadh points to Iran's support for the Lebanese Hezbollah and other Shiite militant groups in the region. The Iranian Foreign Ministry has summoned the Saudi envoy in Tehran to protest, while the Saudi Foreign Ministry later said it had summoned Iran's envoy to the kingdom to protest the critical Iranian reaction to the sheikh's execution, saying it represented "blatant interference" in its internal affairs. In Tehran, the crowd gathered outside the Saudi embassy early today and chanted anti-Saudi slogans. Some protesters threw stones and Molotov cocktails at the embassy, setting off a fire in part of the building, said the country's top police official, Gen Hossein Sajedinia, according to the semiofficial Tasnim news agency. He later said police had removed the protesters from the building and arrested some of them, saying the situation had been "defused." 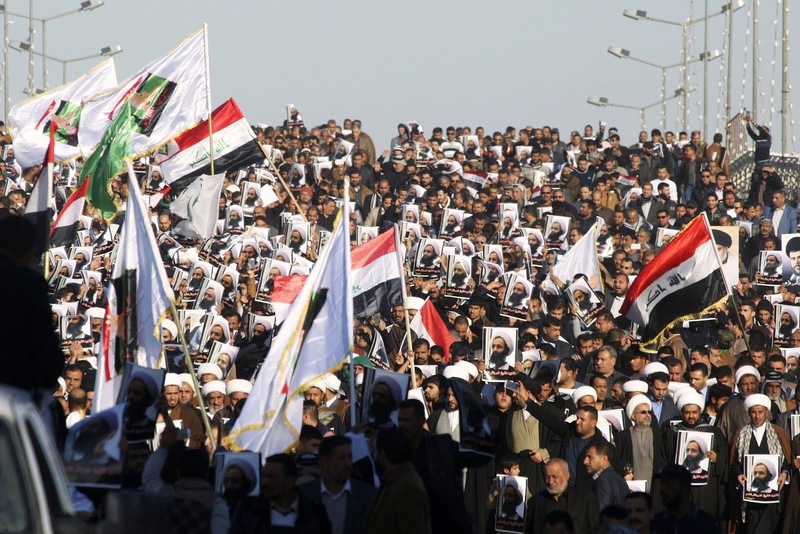 The cleric's execution could also complicate Saudi Arabia's relationship with the Shiite-led government in Iraq. The Saudi embassy in Baghdad reopened for the first time in nearly 25 years on Friday. Already yesterday there were public calls for Prime Minister Haider al-Abadi to shut the embassy down again. Tehran, Jan 3 - Angry crowds protesting at Saudi Arabia's execution of a top Shiite cleric set fire to the kingdom's embassy in Tehran and stormed the building before being cleared out by police, reports said. 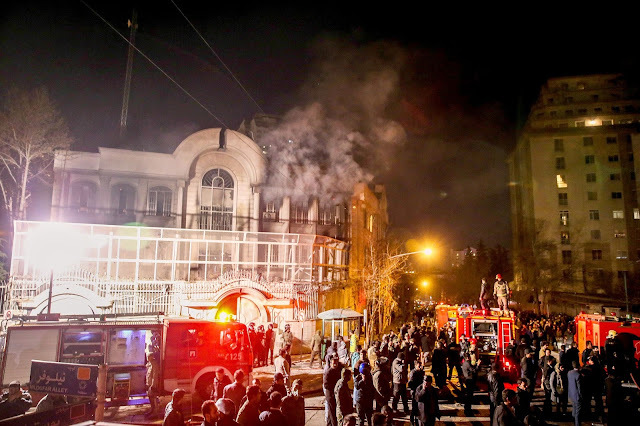 In Mashhad, Iran's second biggest city, demonstrators yesterday meanwhile set fire to the Saudi consulate, according to ISNA news agency, carrying pictures of the alleged assault. The incidents came hours after the announcement of the death of 56-year-old cleric Nimr al-Nimr, a key figure in anti-government protests in the kingdom since 2011. The execution prompted strong condemnation from Shiite- majority Iran and Iraq. "There are flames inside the embassy... demonstrators were able to get inside but have since been cleared out," the news agency said. "The fire has destroyed the interior of the embassy," an eyewitness told AFP. "The police are everywhere and have dispersed the demonstrators, some of whom have been arrested." Protesters had been able to climb up onto the roof of the embassy before they were made to leave, it added. Websites carried pictures of demonstrators apparently clutching the Saudi flag, which had been pulled down. Iranian media quoted foreign ministry spokesman Hossein Jaber Ansari as asking police to "protect Saudi Arabia's diplomatic missions in Tehran and Mashhad... and prevent any demonstrations in front of these sites." Nimr, who spent more than a decade studying theology in Iran, was among a group of 47 Shiites and Sunnis executed yesterday on charges of terrorism. 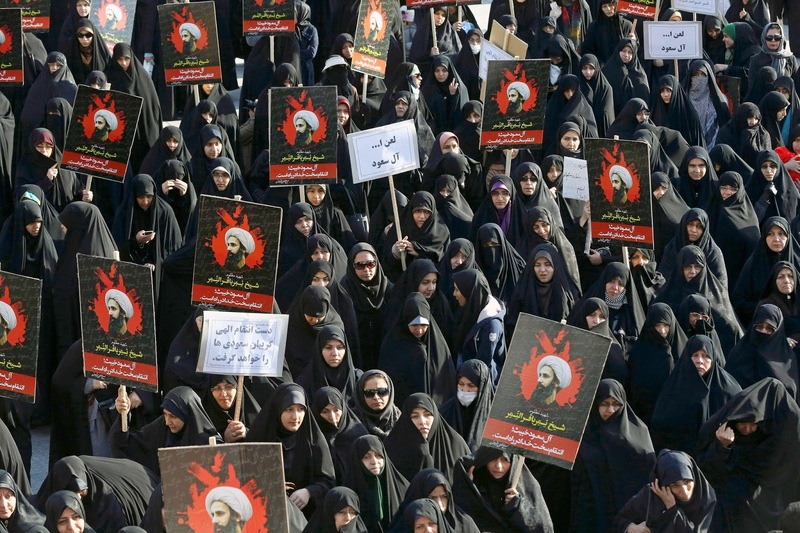 Predominantly-Shiite Iran, the Sunni kingdom's longtime rival, said in reaction to Nimr's execution that "the Saudi government supports terrorist movements and extremists, but confronts domestic critics with oppression and execution." It will "pay a high price for following these policies," Jaber Ansari had warned before the attacks took place. In response, Saudi Arabia's foreign ministry said it had summoned Iran's envoy to protest at the "aggressive Iranian statements on the legal sentences carried out today". The Saudi interior ministry said the men had been convicted of adopting the radical "takfiri" ideology, joining "terrorist organisations" and implementing various "criminal plots". An official list published included Sunnis convicted of involvement in Al-Qaeda attacks that killed Saudis and foreigners in 2003 and 2004. 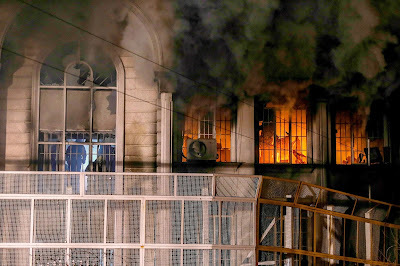 An Iranian official today said 40 people have been arrested after Saudi Arabia's embassy was attacked and set on fire following outrage at the kingdom's execution of a Shiite cleric. The suspects were identified and arrested and other detentions could follow, Tehran prosecutor Abbas Jafari Dolatabadi was quoted by the ISNA news agency as saying. Srinagar, Jan 3 - Scores of Shia community members in Kashmir today held protests against the execution of prominent cleric Sheikh Nimr al-Nimr in Saudi Arabia. 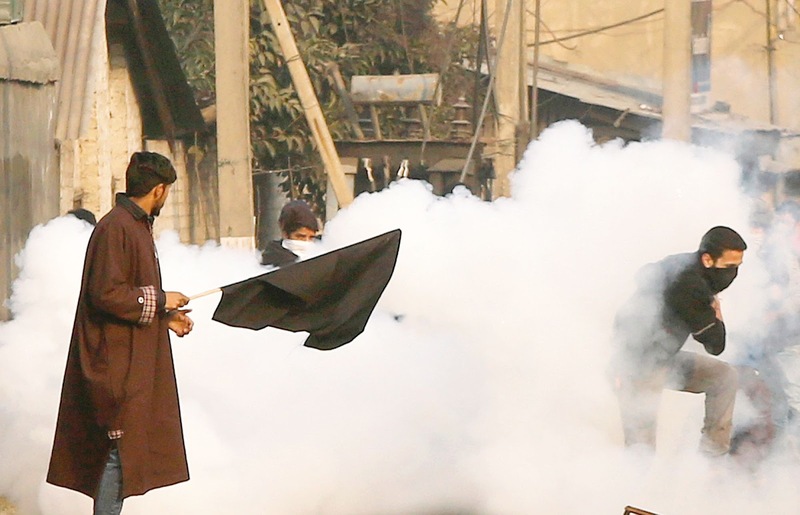 Protests were held at Rainawari area of Srinagar, where scores of community members raised pro-Islam and pro-Nimr slogans, officials said. They said the protesters tried to march towards the city centre here but were stopped by police at Rainawari Chowk, triggering clashes. Police resorted to tear gas shelling to disperse the protesters, the officials said, adding no one was injured in the clashes. 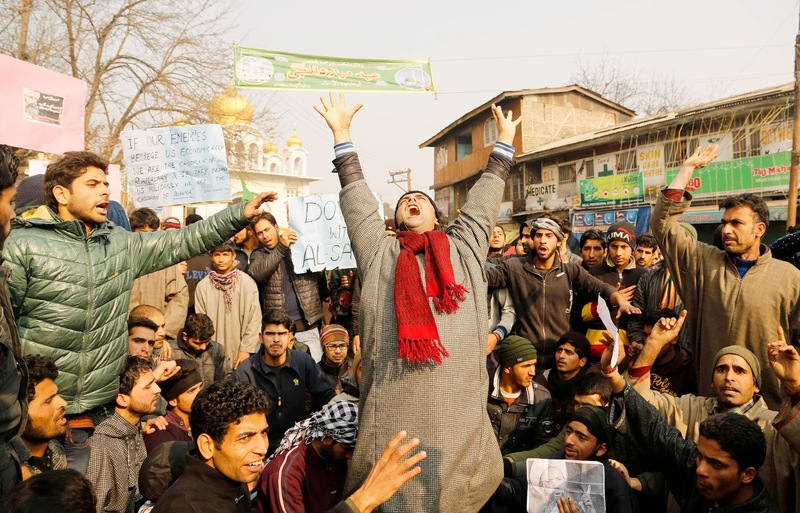 Peaceful protests and sloganeering also took place near Press Colony and Zadibal area of the city and in Budgam district. A Saudi national, al-Nimr, had participated in the Arab Spring protests in 2011. 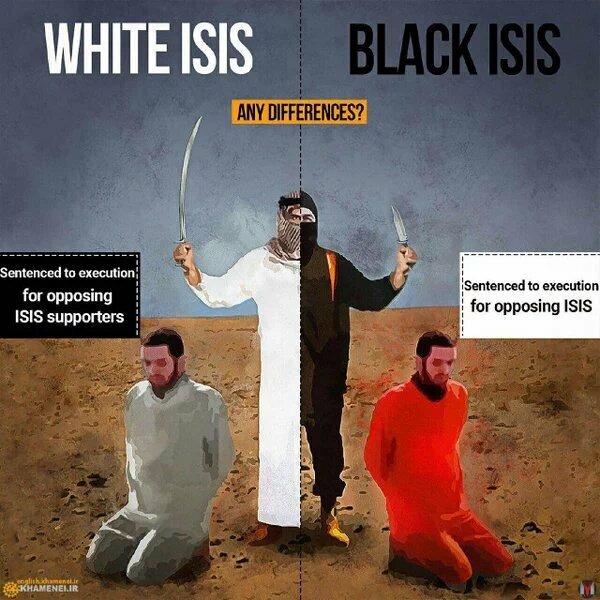 The execution of al-Nimr along with 46 other men, including Shia activists and Sunnis accused of involvement in deadly Al-Qaeda attacks, was announced by the Saudi interior ministry. The brother of Martyr Sheikh Baqir #AlNimr said the #Saudi regime refused to give the families of the Martyrs their bodies. The same thing d Nigerian Govt has done after the brutal Zaria massacre by d Nigerian Army. Until now they have refused to return d bodies. West have never promoted democracy in SaudiArabia,Qatar,Kuwait,Bahrain,Jordan etc. In fact d West does not need democracy in these countries. در پی اعدام «شیخ نمر باقر النمر» از علمای سرشناس شیعه‌‌ در عربستان سعودی، شیخ‌الاسلام مولانا عبدالحمید این اقدام را بر خلاف مصلحت جهان اسلام عنوان کردند. امام جمعه‌ اهل‌سنت زاهدان با اشاره به نامه‌‌ای که مهرماه 1393 مبنی بر لغو حکم اعدام شیخ‌ نمر به پادشاه عربستان سعودی نوشته بودند، به خبرنگار«سنی‌آنلاین» گفتند: بنده پارسال نامه‌ای به پادشاه عربستان سعودی نوشتم و از ایشان خواستم حکم اعدام شیخ نمر متوقف شود و در این حکم تجدید نظر صورت گیرد. ایشان در ادامه افزودند: با توجه به نامه‌هایی که سایر علما و سازمان‌های بین‌المللی برای لغو حکم اعدام شیخ نمر نوشته بودند، انتظار می‌رفت این نامه‌ها مورد توجه قرار گیرد و این روحانی شیعه اعدام نشود؛ اما متاسفانه پاسخی به این نامه‌‌ها داده نشد. گفتنی‌ست وزارت کشور عربستان سعودی امروز در بیانیه‌ای رسمی اعلام کرد، حکم اعدام 47 نفر بنابر اتهامات امنیتی اجرا شده است. در میان اعدام‌شدگان نام “نمر باقر النمر” روحانی شیعه مخالف حکومت عربستان نیز دیده می‌شود. خانواده این روحانی شیعه اعدام وی را تایید کرده است. 1.You don’t have to be able to write like Matthew Parris, Glenn Greenwald or Robert Fisk to shape public opinion. Call upon whatever God-given gift or position you are fortunate enough to have. 2.Handy with graphics? Design an infographic with statistics of the number of Saudi executions this decade, quotes from a leading NGO and other useful information. Share this online. 3.Got a YouTube page? Post a vlog about Nimr’s tragic execution and the human rights abuse which transpire on a daily basis in Saudi Arabia. Student at college or university? Organise a seminar or put together a short petition, raise awareness of the plight of minorities in Saudi Arabia and around the world. At work? Put together a small fund with colleagues at work to donate towards an NGO battling tyranny in the Middle East.